Derbyshire lost their LV= Division Two fixture with table topping Lancashire by an innings and 15 runs inside the first session of the final day of the game at Southport. On a morning when Lancashire’s spinners bowled unchanged at Trafalgar Road, Derbyshire’s young batsmen found the pressure and a turning pitch all too much for them and subsided from 123 for three to 166 all out in the 36.1 overs that Steven Croft’s spinners bowled in 97 minutes. Arron Lilley took four for eight in 18.1 overs on the final morning and finished with career-best figures of five for 23 from 26 overs. The off-spinner made the first breakthroughs on the final day when he bowled Tom Taylor for two and then had Scott Elstone caught at backward short leg by Ashwell Prince for nought. At the other end Simon Kerrigan was no less effective and ended the ininngs with four for 80 from 36 overs. Indeed, the England slow left-armer took the prize wicket of Hashim Amla for 11 when a fine delivery eluded the South African’s studied forward defensive shot. That left Derbyshire on 141 for six, still 40 runs short of making Lancashire bat again, and an innings defeat became probable when Kerrigan had Shiv Thakor caught by Alviro Petersen at second slip for two. Next over David Wainwright was caught at the wicket for 10 when attempting to cut a ball from Lilley and Harvey Hosein was bowled by Kerrigan seven minutes later. Lancashire’s victory was completed when David Footitt’s cheery swipe only resulted in him being bowled by Lilley for five and the off-spinner thus achieved career-best bowling and batting performances in the same match. 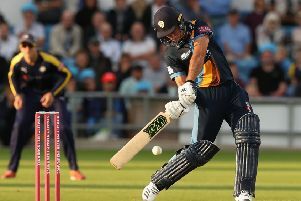 Derbyshire’s batsmen were left to reflect on the fact that they had probably scored insufficent runs in the first innings of the game, although the loss of both Ben Slater and Chesney Hughes in the final two overs of Tuesday’s play was also significant. Nevertheless, Billy Godleman’s team took six points from the match. For their part, Lancashire took a maximum 24 points.